Seriously who invented this time change thing?!?! Every year, as a Sleep Consultant I rack my braining wondering how to help my clients through the idea that their children MAY wake up at 5am instead of 6am – and believe me I totally empathize because I also don’t want to be getting up earlier with my own children. Every year without fail, it hurts by brain trying to figure out the math of getting your kids back on their regular schedule – just sayin’ – but I’m happy to do it! 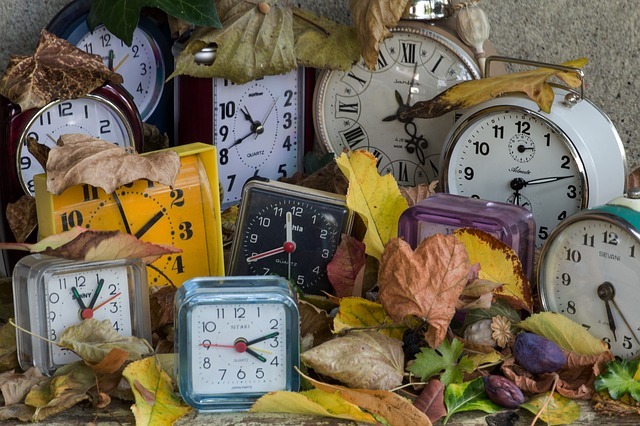 Ok, so here it is – a cheat sheet on the Fall Back Time Change – yes, your welcome. My brain is recovering nicely thank you! 1. Don’t change the clocks before you go to bed on Saturday (Halloween this year). Change them in the morning, once everyone has started their day on Sunday (unless you have to be somewhere, then you may want to know what the “new” time is!). 2. Push your children to stay up an extra ½ hour for naps and bedtime. For example, if they normally go to bed at 7pm, the “new” time will be 6pm, so put them to bed at the “new” time of 6:30pm. So you are pushing them to stay up an extra ½ hour because their body clock (“old time”) will be 7:30pm. 3. Do this for 3 days, then on day 4 move them to their normal bedtime. 4. For babies, you may not be able to keep them up for an extra ½ hour, so just start with an extra 10-15 minutes each nap time and at bedtime, until they reach the “new” time. 5. Remember, it can take up to 1 week for the body to adjust, but sometimes even as long as 4 weeks. Be patient and hang in there!